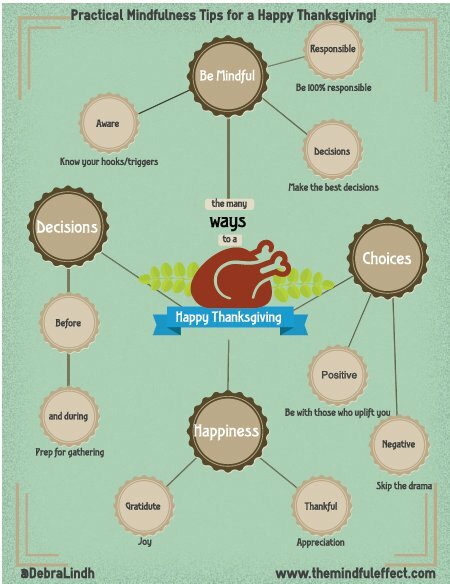 Practical Mindfulness Tips for a Happy Thanksgiving! The holidays. Just the thought brings up a lot of feelings and emotions. As I write this post, I’m thinking about the person and people who are getting ready for today’s family gathering. You know, the big family Thanksgiving feast that offers more than just food. It’s the “dance” of relationships, interactions, the memories of past that haunt, and even can plague a person’s mind. Yup. I’m thinking of you. Maybe you’re already experiencing stress just thinking of today’s family gathering which is hours away. Will sister Sue tease you about your weight/job/etc., or will Uncle Joe make “that” comment which causes your stomach to cramp because his comments are so incompatible with your values and beliefs…but that’s Uncle Joe, right? Some people say these types of family dynamics are what makes family – family. I disagree. These types of dynamics lack responsibility, accountability, and perpetuate a continuation of inherited patterns of dysfunction all which lead to stress and unhappiness. So, what can we do? How can people prepare for today’s family gathering and still have a Happy Thanksgiving? Some practical mindfulness (that means real-time awareness…stuff you can use/do anywhere, anytime…no need to “schedule” to breathe..btw, you’re breathing right now) tips for a Happy Thanksgiving. 1. Be Mindful – Being mindful begins with being aware; knowing your hooks and triggers (aka buttons pushed – what are they? Who knows them? Who’s really good at pushing them?). Also, be 100% responsible for you and make the best decisions for yourself. Know that the word “best” varies from person to person and here I’m talking to you, not mom, dad, Sue, Uncle Joe – but you. Being mindful starts with the self; meaning yourself. It’s internal and then extended outwardly. So, be mindful, 100% responsible for your thoughts/actions, and make the best decisions for yourself. 2. Decisions – Decisions, decisions, decisions. How do we make the right decision? What if we make the wrong decision? First, not making a decision is really making a decision; it’s a decision of denial. So, make a decision; any decision…just make one. Secondly, fear is our worst enemy. Fear causes people to worry and paralyzes people into an infinite loop of “what if” and “should.” Find comfort in realizing that making a decision is a first step in being responsible – which is one of the best gifts to yourself and your family. Arm yourself with making a commitment to yourself before the family gathering. Yes, a commitment to yourself. For example, how much time are you willing stay at the event – 3 hours, 4 hours? Make a commitment, set a limit, and stick to it! The sticking to it is a huge part of the decision of a commitment to yourself. Lastly, prepare for decisions during the event – decide now (not when you get there) how you want to respond to Sister Sue and Uncle Joe. Keep in mind that a response does not necessarily mean a verbal response, what it means is what do you want to do and how do you want to behave in situations that can for example push your buttons. Know now. Prepare now. Do then. 3. Choices – Choices come in two basic forms: Negative and Positive. For family gatherings, negative choices would include doing the dance with Uncle Joe and Sister Sue by returning the fuel and pushing their buttons, or participating in gossip and drama. Engaging in these types of choices is fairly obvious as they’ll often be stressful, draining, and toxic. On the other hand, positive choices such as hanging out with people who you truly enjoy their company and playing with the kids are uplifting and reduce stress. 4. Happiness – Isn’t this what we are try to achieve, feel, and be when getting together with family; especially during Thanksgiving? While gratitude brings joy and thankfulness brings appreciation, we often need to remind ourselves – to be mindful – to be aware – and to allow ourselves (yes, allow ourselves) to be happy. We can do this by reflecting on what we are grateful for, who we are thankful for in our lives, and by counting our blessings. We all have blessings. Be mindful, aware, thankful, and grateful for those blessings. These will lead to joy and happiness! Thank you for reading my blog. Thank you for allowing me to serve you. I’m humbled to do this work and grateful for the many people who’ve shared what this work had done for them. Happy Thanksgiving, Everyone! Share your comments, postings, let me know how this worked for you!